Lee Clark says he decided to join Bury to further his chances of managing in the English Premier League. Former Kilmarnock manager Lee Clark has urged the Rugby Park board to immediately appoint his No 2, Lee McCulloch, as his replacement – or risk ruining the good work they did together. The 44-year-old drove south yesterday to take over at League One strugglers Bury, who had agreed a compensation package with the Ayrshire club before he had been made aware of their offer. However, he insists that McCulloch, expected to take charge for the visit of Aberdeen on Sunday, is the perfect candidate to maintain the progress he says has been made during their year together at the club. McCulloch left Rangers in the summer of 2015 to become player/coach under Gary Locke in the summer of 2015 but the 37-year-old made just one first-team outing. When Locke resigned midway through last season, McCulloch, pictured right, took the team for two Scottish Cup-ties against Rangers but stressed that he didn’t want the job full-time. Clark promoted him when he succeeded Locke and claims he would be the perfect choice for Killie’s directors. 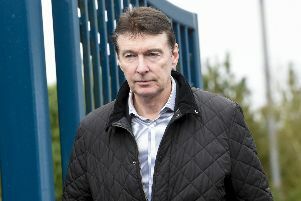 “The best thing the board could do now is to give Lee McCulloch my job,” he said. “Don’t shilly-shally and make him the caretaker manager or the interim manager – just give him the job. fantastic first-team coach, so, if I’m consulted, I would unreservedly recommend letting the pair of them carry on. “A lot of players have been signed in the last two transfer windows because we had no option. It takes time for so many signings to gel and that’s just starting to happen now so the last thing Kilmarnock needs is more instability. Lee and Peter and myself were on the same wavelength, football-wise. We had similar ideas and thoughts on how the game should be played. Clark’s family remained in the north east of England throughout his time in Ayrshire but he denied that was a factor in his decision to accept the offer from Bury, who are fourth from bottom of League One. “It came completely out of the blue for me,” he said. “I got a call from the Kilmarnock directors a couple of days ago, saying that they had had an approach from Bury for my services and that they had agreed a fee. Everything has moved quickly since then but it’s got nothing to do with being closer to my family – in this game, you go where the work is. “My motivation for leaving was that I was being offered another chance to be successful in England. For me, the main ambition is to manage in the Premier League and I’ll have a better chance to show clubs down there what I can do if I’m operating there as well. It’s as simple as that. Clark takes over from Chris Brass, who was appointed head coach on an interim basis until the end of the season after David Flitcroft lost his post as manager in mid-November. Bury, in 21st place in League One, two points from safety, revealed they had agreed a compensation package with Kilmarnock to ensure Clark’s release. Kilmarnock decided they could not stand in the former Huddersfield, Birmingham and Blackpool manager’s way. Clark leaves Killie sixth in the Ladbrokes Premiership exactly a year after taking charge when they were 10th. The 44-year-old steered the club to safety last season through a 4-1 aggregate play-off victory over Falkirk and immediately set about transforming the squad. The former Newcastle midfielder told 14 players they were free to leave the next day, and there was eventually a turnover of 35 players just after the transfer window closed. Eight of his 16 summer signings have already left and he signed seven more players in January, most of them on loan deals.